Ringgold Middle School participates in the Rattler Homecoming Parade on Wednesday, October 20, 2010. As part of the festivities RMS celebrates 2010 by recognizing the football teams and featuring them on a designated float at this event. 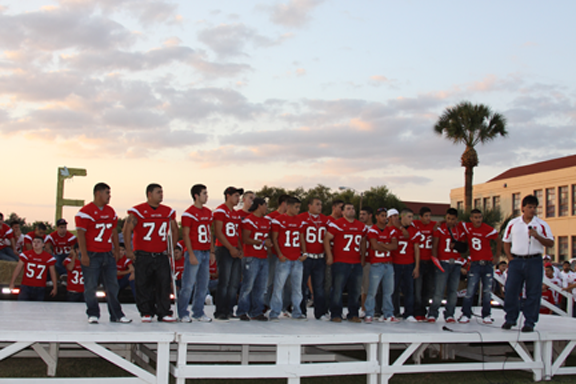 Rio Grande City High School Mighty Football team captains encouraged the players with motivational words on Wednesday, October 20, 2010. 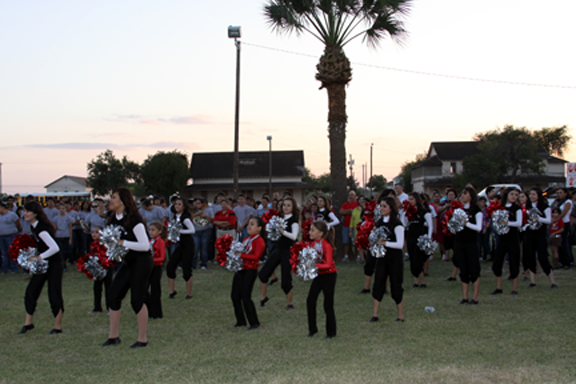 The whole community came out to support the Rattlers during the Homecoming Parade and Bonfire. The program consisted of different performances by the school drill teams, cheerleaders, dance teams, Mariachi Cascabel and the Rattler Band. Mr. Leo Lopez-School Board Member and Municipal Judge addressed the players with much enthusiasm. The players were excited as the rally continued with the burning of the opponent's team's Letter and Mascot. RGCCISD photo. The Rio Grande City High School Diamondback Drill Team performs during the Homecoming activities on Wednesday October 20, 2010. The team is under the direction of Ms. Yolanda Flores. She encouraged the Mighty Rattler Team to go out on Friday and defeat Edcouch Elsa's Yellow Jackets. Go Rio! The float that was done in 2010. I have a car trailer and I would love to see the whole float. Can someone email a picture of it.